The traditional smallpox vaccine, administered by scarification, was discontinued in the general population from 1980, because of the absence of new smallpox cases. However, the development of an effective prophylactic vaccine against smallpox is still necessary, to protect from the threat of deliberate release of the variola virus for bioterrorism and from new zoonotic infections, and to improve the safety of the traditional vaccine. Preventive vaccination still remains the most effective control and new vectors have been developed to generate recombinant vaccines against smallpox that induce the same immunogenicity as the traditional one. As protective antibodies are mainly directed against the surface proteins of the two infectious forms of vaccinia, the intracellular mature virions and the extracellular virions, combined proteins from these viral forms can be used to better elicit a complete and protective immunity. 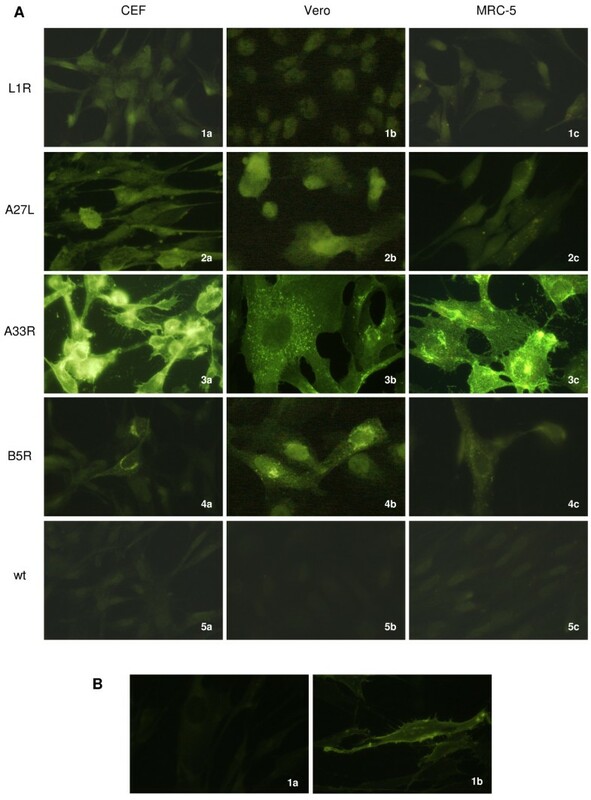 Four novel viral recombinants were constructed based on the fowlpox genetic background, which independently express the vaccinia virus L1 and A27 proteins present on the mature virions, and the A33 and B5 proteins present on the extracellular virions. The correct expression of the transgenes was determined by RT-PCR, Western blotting, and immunofluorescence. Using immunoprecipitation and Western blotting, the ability of the proteins expressed by the four novel FP L1R , FP A27L , FP A33R and FP B5R recombinants to be recognized by VV-specific hyperimmune mouse sera was demonstrated. By neutralisation assays, recombinant virus particles released by infected chick embryo fibroblasts were shown not be recognised by hyperimmune sera. This thus demonstrates that the L1R, A27L, A33R and B5R gene products are not inserted into the new viral progeny. Fowlpox virus replicates only in avian species, but it is permissive for entry and transgene expression in mammalian cells, while being immunologically non–cross-reactive with vaccinia virus. These recombinants might therefore represent safer and more promising immunogens that can circumvent neutralisation by vector-generated immunity in smallpox-vaccine-experienced humans. Preventive vaccination still remains the most effective control against orthopoxvirus (OPXV) infections, as it can elicit neutralising antibodies against an incoming virus. The traditional smallpox vaccine was administered by scarification, but its use was discontinued in the general population from 1980, because of the absence of new smallpox cases. However, attenuated strains of vaccinia virus (VV) have been produced and tested in humans in attempts to develop strains with lower reactogenicity and fewer side effects. Indeed, in spite of the discontinuation of the smallpox vaccination programmes, the threat of deliberate release of variola virus for bioterrorism and the need for protection from new zoonotic infections still remain [1–4]. Also, the monkeypox virus (MPXV) resembles smallpox in the severity of its symptoms, and it might be a potential bioweapon if cowpox and MPXV can adapt to grow and spread in humans . VV recombinants that express different transgenes have already been used in clinical studies for the prevention and immunotherapy of different infectious diseases. However, although extremely effective, VV raises safety concerns due to its high reactogenicity, its ability to spread to non-vaccinated subjects, and its moderate to severe side effects , especially in immune-compromised individuals . Such side effects are not acceptable in a post-endemic smallpox era [6, 8]. Clinical trials have also been performed with the attenuated VV-derived Lister clone LC16m8 and the modified vaccinia Ankara (MVA). LC16m8, which replicates in humans, showed protective efficacy in animal models, and was safely used for over 50,000 children in Japan in 1974 . MVA has an extensive history of safety in humans, it is immunogenic and efficacious in both mice and non-human primates, where it can also protect against MPXV, and it is a leading candidate for an alternative smallpox vaccine [10–13]. However, as MVA replication in mammals is only partially abortive , and induces lower immunogenicity than the traditional smallpox vaccine , the search for new alternatives is still ongoing [16, 17]. Failure of protection with MVA has been demonstrated in animals with CD4/CD8 combined immunodeficiency  and in Rhesus macaques infected with simian immunodeficiency virus with a very low cell count of the immune repertoire . The VV antigens that protect against smallpox are not completely known. However, analysis of the immune responses after immunisation with traditional vaccines has shown that the neutralising antibodies are mainly directed against the surface proteins of the two infectious forms of OPXVs: the intracellular mature virions (MVs) and the extracellular virions (EVs). MVs are released after cell lysis, and they are responsible for the host-to-host spread because of their stability in the extracellular environment. In contrast, EVs are wrapped by an additional envelope, and they have an important role in cell-to-cell spread; i.e., in the dissemination within the host [19, 20]. In particular, the L1 and A27 proteins on MVs and the A33 and B5 proteins on EVs are involved in the attachment, fusion and penetration of the virus into target cells [20, 21]. Combined DNA-based vaccines expressing these four proteins are more protective than vaccines carrying individual immunogens [22, 23], possibly because of the induction of synergistic antibodies that can act at the different infection phases, both at the initial exposure, and during viral dissemination [24, 25]. Although other immunogens have been used to induce protective immunity, when these four genes have been delivered as DNA expression plasmids  or as virus-like replicons , they have already been shown to induce functional antibodies and to protect mice against VV parenteral/ intranasal challenge, and monkeys against MPXV intravenous challenge [26, 27]. In the present study, four novel recombinants were constructed based on the fowlpox (FP) genetic background that express the VV L1R, A27L, A33R and B5R genes independently. Their correct expression was determined by RT-PCR, Western blotting and immunofluorescence, both in replication-permissive chick embryo fibroblasts (CEFs) and in non-permissive mammalian Vero and MRC-5 cells. The ability of the proteins expressed by the four novel recombinants to be recognized by VV-specific hyperimmune mouse sera was demonstrated by immunoprecipitation followed by Western blotting (IP/WB) using hyperimmune mouse serum. The recognition by VV-specific antibodies of a mixture of the four FP recombinants (4FPmix) was tested using a plaque-reduction neutralisation assay. FP vectors are replication-restricted to avian species , but they are permissive for entry and transgene expression in mammalian cells, while being immunologically non–cross-reactive with VV. They therefore represent safer immunogens , as they can circumvent neutralisation by vector-generated immunity in smallpox-vaccine-experienced humans. The advanced replication cycle, long transgene expression, and balanced Th1/Th2 cytokine induction of FP-based recombinants  might elicit a more effective immune response. Specific-pathogen-free primary CEFs were grown in Dulbecco’s modified Eagle’s medium (DMEM) supplemented with 5% heat-inactivated calf serum (Gibco Life Technologies, Grand Island, NY, USA), 5% Tryptose Phosphate Broth (Difco Laboratories, Detroit, MI, USA), 100 U/ml penicillin and 100 mg/ml streptomycin. Green monkey kidney (Vero) cells, and normal human lung fibroblasts (MRC-5 cells) were grown in DMEM supplemented with 10% heat-inactivated calf serum, 100 U/ml penicillin and 100 mg/ml streptomycin. 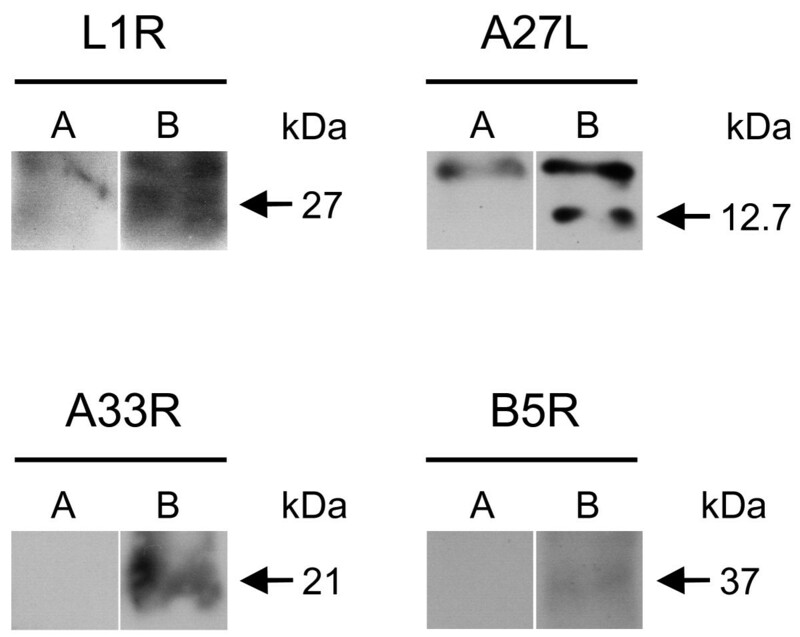 Four FP-based recombinants expressing the VV MV L1 and A27 proteins and the EV A33 and B5 proteins were obtained by in-vitro homologous recombination [30–32], with minor modifications. FPwt was obtained by J. Taylor (Wadsworth Center, NY State Dept. of Health, Albany, NY) . Molecular cloning of pFP A33R and preparation of the FP A33R recombinant have already been described . For FPL1R, FP A27L and FP B5R , these genes were PCR-amplified from the Lancy strain of VV DNA (Berna Biotech, courtesy of M. R. Capobianchi, L. Spallanzani National Institute for Infectious Diseases, Rome, Italy). They were separately inserted into the pcDNA3 and pBSII plasmids (L1R), the pBSII plasmid (A27L), or the pcDNA3 and pAFTd plasmids (B5R). Insertion into the pFPMCS recombinant plasmid was performed downstream of the VV H6 early/ late promoter , inside the 3-β-hydroxysteroid dehydrogenase 5-delta 4 isomerase gene interrupted by a multiple cloning site. The amplification of L1R was carried out using the forward V182 (5’ GGG AAG CTT TTA AAT GGG TGC CGC AGC AAG CAT ACA 3’) and reverse V183 (5’ GGG CTC GAG ATT TTC AGT TTT GCA TAT CCG TGG TAG 3’) primers. For A27L, the forward V354 (5’ CCC GGG AAG CTT AAT GGA CGG AAC TCT TTT C 3’) and reverse V353 (5’ TTT TGG TAC CAT AAA AAT TAC TCA TAT GGG CGC CG 3’) primers were used. For B5R, the forward V184 (5’ GGG AAG CTT AAA AAT GAA AAC GAT TTC CGT TGT TAC 3’) and reverse V185 (5’ GGG CTC GAG ATA TTT ACG GTA GCA ATT TAT GGA ACT 3’) primers were used. Amplifications were performed as described previously , using 2.5 mM MgCl2 and 2 mM MgSO4, with annealing at 61°C for 30 s (L1R and A27L), or at 57°C for 30 s (B5R) and extension at 72°C for 45 s. The β-actin reference gene was amplified using the forward V84 (5’ CTG ACT ACC TCA TGA AGA TCC T 3’) and reverse V85 (5’ GCT GAT CCA CAT CTG CTG GAA 3’) primers, with 1 mM MgSO4 and with annealing at 60°C for 30 s. The plasmid DNAs were purified and the genes were sequenced (Genenco, MMedical, Milan, Italy), to exclude any mutations arising from the PCR amplification. The plasmids are designated as pFP L1R (8,992 bp), pFP A27L (8,568 bp), pFP A33R (8,764 bp), and pFP B5R (9,173 bp). Recombinants were obtained by in-vitro homologous recombination in CEFs, using FPwt and the different pFP recombinants, with minor modifications. Recombinant plaques were identified by autoradiography after hybridisation with [32P]-labelled specific probes, and then subjected to multiple cycles of plaque purification. One clone was selected for correct and high expression of each gene by Western blotting, using specific antibodies. The recombinant viruses were amplified in CEFs, purified on discontinuous sucrose density gradients, and titrated essentially as already described . Briefly, the cells were harvested, ultracentrifuged at 30,000× g for 2 h at 4°C, and the pellets resuspended in 1 mM Tris, 150 mM NaCl, 1 mM EDTA, pH 7.4. The pellet then had 0.06% trypsin added, and was incubated for 5 min at 37°C, and the virus was released from the cells by sonication. The supernatant was overlaid onto a discontinuous 30% to 45% (w/w) sucrose gradient, in the same buffer. After ultracentrifugation at 38,000× g for 1 h, the viral band at the interface was recovered, diluted with 1 mM Tris-HCl, pH 9, and pelletted at 67,000× g for 1 h. The purified virus was resuspended in Ca++- and Mg++-free phosphate-buffered saline (PBS-), disaggregated by sonication, aliquoted, and frozen at -80°C until use. The expression of L1R, A27L, A33R and B5R was investigated by RT-PCR. The cells were infected with 1 plaque-forming unit (PFU)/cell of the FP L1R , FP A27L , FP A33R or FP B5R recombinants, and the mRNAs were extracted 24 h post-infection (p.i.) from CEFs and Vero and MRC-5 cells, as described previously . Briefly, 50 ng RNA from each sample was used in a final volume of 10 μl, in the presence of 1 μM of each primer, 200 mM of each dNTP, 0.1 U/μl Thermus flavus DNA polymerase, and 0.1 U/μl avian myeloblastosis virus reverse transcriptase, using the V182/V183 primers for L1R (779 bp), V354/V353 for A27L (363 bp), V186/V187 for A33R (584 bp), V184/V185 for B5R (980 bp), and V84/85 (518 bp) for β-actin detection under the conditions described above. RNA from FPwt-infected cells was used as a negative control. The RT-PCR products were quantified using the ImageJ software . To determine whether the L1, A27, A33, and B5 proteins were expressed by the recombinants at the same levels in the different cell lines, CEFs and Vero and MRC-5 cells were infected (10 PFU/cell) and examined by Western blotting, as already described . The blotted nitrocellulose membranes were incubated overnight at 4°C with 1:100 dilutions of the primary antibody. Alternatively, two different specific antibodies (Bei resources, Manassas, VA, USA) were used for each gene: a mouse monoclonal antibody followed by goat anti-mouse horseradish-peroxidase-conjugated serum, and a rabbit polyclonal antibody followed by goat anti-rabbit horseradish-peroxidase-conjugated serum (1:2,000 dilution; DakoCytomation, Carpinteria, CA, USA). After a 1-h incubation and 2 h of washes, the proteins were revealed using the ECL system (EuroClone, Pero, Milan, Italy). Cells infected with FPwt were used as the negative control. Conventional Western blotting was also performed after immunoprecipitation of cell lysates using specific antibodies (IP/WB). Vero cells were infected as for Western blotting, and immunoprecipitation was performed essentially as already described , with minor modifications. Sixteen hours p.i., the cells were harvested by resuspension in 1 ml lysis buffer (150 mM NaCl, 1 mM EDTA, 10 mM Tris-HCl, pH 7.4, 0.2 mg/ml PMSF, 1% NP40, 0.01% sodium azide) per Petri dish, and 0.6 TIU aprotinin (Sigma, St Louis, MO, USA). The lysate was clarified by centrifugation at 9,000× g for 20 min at 4°C, and immunoprecipitation was performed with 10 μl anti-IHD-J mouse hyperimmune serum, from our laboratory. The proteins were resolved using 15% SDS-PAGE, identified using a polyclonal antibody (Bei resources), and revealed using the ECL system. Protein expression by the recombinant viruses was also examined by immunofluorescence, which was carried out in CEFs and Vero and MRC-5 cells, essentially as described previously . In particular, after infection at 37°C for 1 h with 1 or 3 PFU/cell (depending on the different cytopathogenicity of the recombinants), the cells were grown for 6 or 15-18 h before immunofluorescence. The cells were fixed either with only fresh 2% paraformaldehyde in PBS- for 10 min, for membrane immunofluorescence, or with paraformaldehyde followed by 100% cold acetone for 5 min at -20°C, for cytoplasmic immunofluorescence. The samples were incubated for 1 h with monoclonal or polyclonal antibodies (Bei resources) (Table 1). FITC 1:100-diluted anti-mouse or anti-rabbit secondary antibodies (Cappel, MP Biomedicals, Inc., Aurora, OH, USA) were used. Cells infected with FPwt were the negative controls. The samples were viewed under a Zeiss Axioskop epifluorescence microscope. neg, no positive IF at any dilution. The IHD-J strain of VV was kindly obtained from S. Dales (University of Western Ontario, London, Canada)  grown in Vero cells, and used to repeatedly infect Balb/c mice (1 × 105 PFU/mouse) via the airways, to obtain VV-specific hyperimmune serum. A mixture of the four FP recombinants (4FPmix) was also prepared in CEFs, by co-infection with the four FP viruses (3 PFU/cell/each recombinant virus). The IHD-J and the 4FPmix viruses were amplified in Vero cells and CEFs, respectively, purified on discontinuous sucrose density gradients, and titrated as already described. Recognition of the 4FPmix by VV-specific mouse antibodies was tested using the virus neutralisation assay. 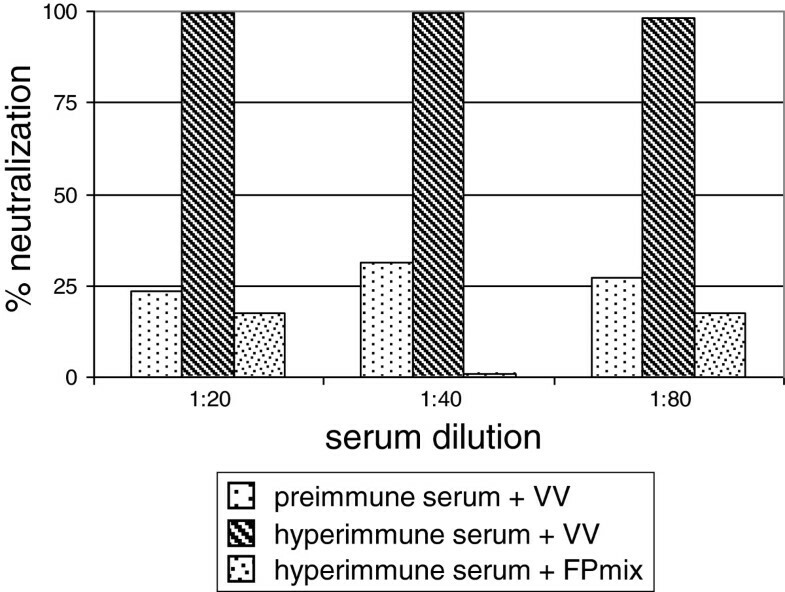 VV IHD-J hyperimmune mouse serum was used to determine the inhibition of the infectivity of the 4FPmix. Neutralisation assays were performed by pre-incubating the 4FPmix with an equal volume of heat-inactivated hyperimmune serum, for 1 h at 37°C. 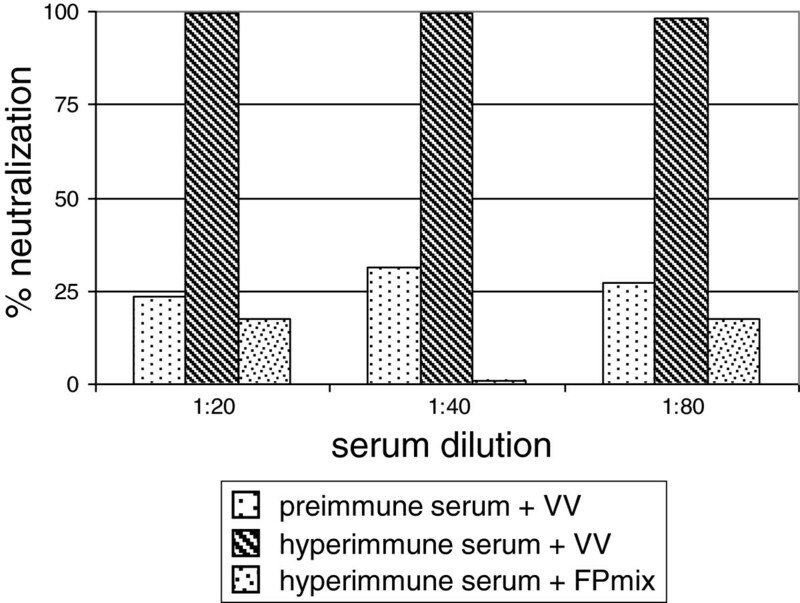 Pre-immune serum was used as a negative control. The IHD-J virus was used in a parallel test with both pre-immune and hyperimmune serum. The sera were diluted starting from a 1:20 dilution in DMEM. The viral inoculum was adjusted to give approximately 102 PFU/Petri dish. Infection was allowed to proceed for 1 h at 37°C. The cells then had 5 ml DMEM with agarose LE 0.7% (SeaKem, FMC BioProducts, Rockland, ME, USA) added. The plaque numbers were counted on day 4 p.i., after adding an agarose layer containing 1.5% neutral red (Gibco). The neutralisation is expressed as the percentage of reduction of plaque numbers versus the control, where the viral inoculum was incubated with no serum. After RNA isolation from the infected CEFs and Vero and MRC-5 cells, the transcripts were detected by RT-PCR after an overnight incubation, as 779-bp, 363-bp, 584-bp and 980-bp fragments in all of the cell lines infected by the FP L1R , FP A27L , FP A33R and FP B5R recombinants, respectively (Figure 1, lanes A). As determined by densitometric analysis, similar levels of expression were observed in the different cells for each recombinant, except for FP B5R , that expressed the B5R mRNA 2.1 times more in human MRC-5 cells than in CEF and Vero cells. The amplification of human β-actin RNA is also shown as a 518-bp band (Figure 1, lanes A). As expected, the FPwt-infected cells used as a negative control did not show any specific band (Figure 1, lanes B). Expression of the FP L1R , FP A27L , FP A33R and FP B5R transcripts by RT-PCR in replication-permissive and non-permissive cells. Following infection of CEFs and Vero and MRC-5 cells with the four recombinants, transcript expression was detected after overnight infection, as 779-bp (panel a), 363-bp (panel b), 584-bp (panel c) and 980-bp (panel d) fragments. Expression of human β-actin is shown as a 518-bp band (panels a-d). No specific band is seen for cells infected with FPwt, which was used as a negative control (lanes B). 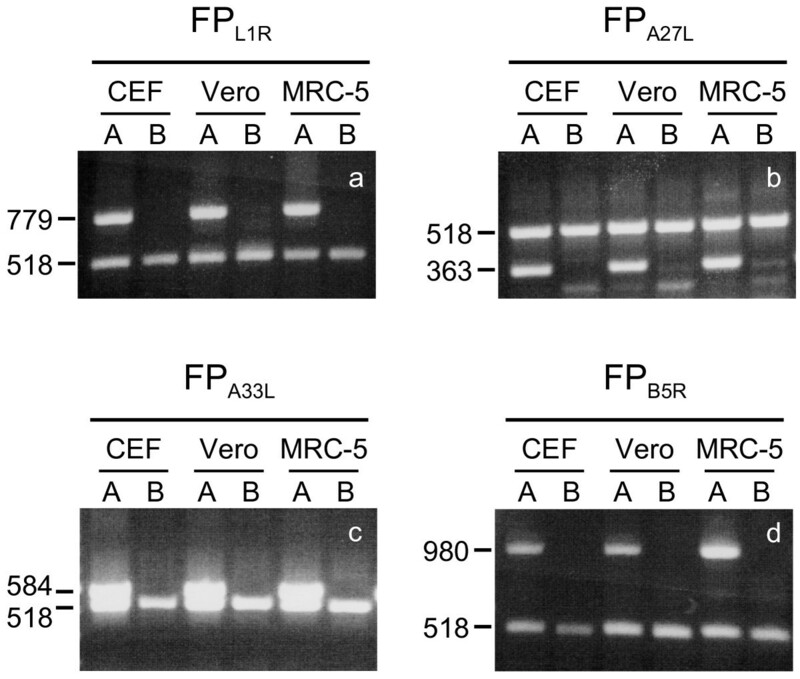 The FP recombinants expression was verified by Western blotting on lysates of both replication-permissive CEFs and non-permissive Vero and MRC-5 cells, which were infected separately with FP L1R , FP A27L , FP A33R and FP B5R , or with FPwt. 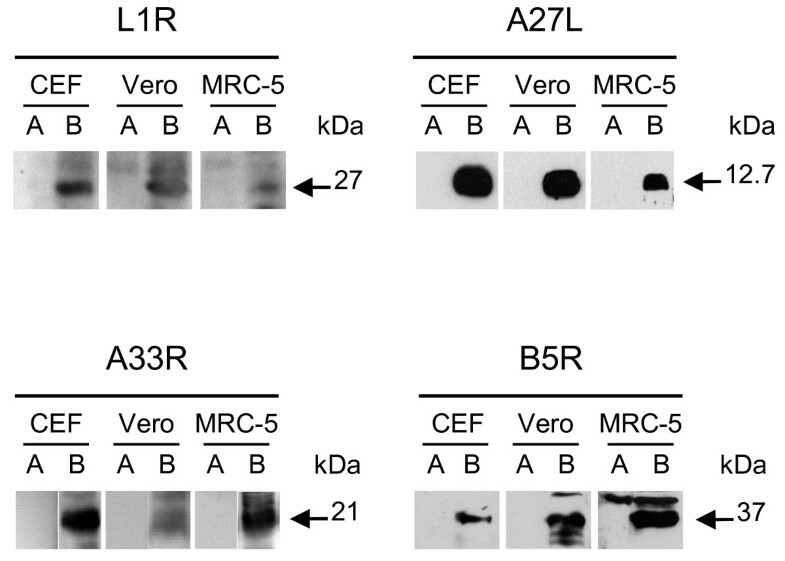 The polyclonal primary antibodies recognised specific 27-kDa, 12.7-kDa, 21-kDa and 37-kDa bands, which corresponded to the L1, A27, A33 and B5 proteins, respectively, in the infected CEFs and Vero and MRC-5 cells (Figure 2, lanes B). As determined by densitometric analysis, the expression levels for FP L1R were 4.2-fold and 3.9-fold higher in CEFs and Vero cells than in MRC-5 cells, those for FP A27L were 2.9-fold and 2.5-fold higher in CEFs and Vero cells than in MRC-5 cells, those for FP A33R were 2.6-fold and 3-fold higher in CEFs and MRC-5 cells than in Vero cells, and those for FP B5R were 2.1-fold and 3.1-fold higher in Vero and MRC-5 cells than in CEFs (Figure 2; lanes B). No specific bands were recognised when the cells were infected with FPwt (Figure 2; lanes A). The corresponding monoclonal antibodies showed similar specificity, but lower binding activity (data not shown). Transcript expression by Western blotting in replication-permissive and non-permissive cell lines. All of the different cell lines, the CEFs and Vero and MRC-5 cells, were infected with 10 PFU/cell of FP L1R , FP A27L , FP A33R or FP B5R , and harvested 15-18 h p.i.. Rabbit polyclonal primary antibodies recognised the corresponding proteins, in all of the cell lines (lanes B). The expression levels were quantified by densitometric determinations. No specific bands were seen when the cells were infected with FPwt (lanes A). IP/WB was used to test whether the hyperimmune mouse sera could also recognise the FP-expressed proteins. After infection of the Vero cells with the FP L1R , FP A27L , FP A33R and FP B5R recombinants, the specific proteins were immunoprecipitated from cell lysates using sera from mice that had been repeatedly immunised with VV IDH-J (Figure 3, lanes B). No specific bands were seen for cells infected with FPwt (Figure 3, lanes A). Immunoprecipitation/Western blotting. To verify the recognition of the FP-expressed proteins also by VV-specific hyperimmune mouse sera, immunoprecipitation was performed, followed by Western blotting. After infection with FP L1R , FP A27L , FP A33R or FP B5R , the specific proteins were immunoprecipitated by the hyperimmune sera (lanes B). No specific bands were seen in cells infected with FPwt (lanes A). To identify differences in the heterologous protein expression and subcellular localisation in the different cell lines, immunofluorescence was performed at 15-18 h p.i. 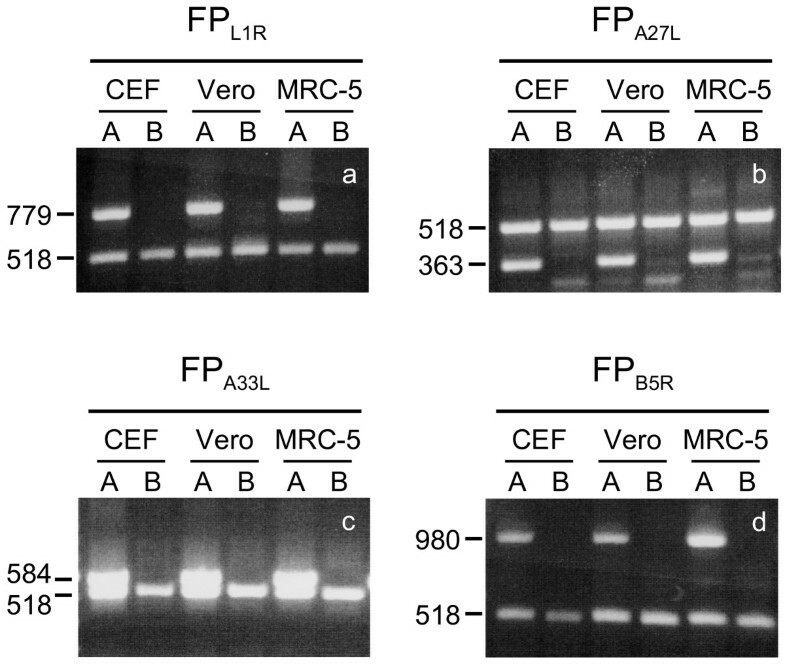 in CEFs and Vero and MRC-5 cells infected with the FP L1R , FP A27L , FP A33R and FP B5R recombinants, or with FPwt (Figure 4). The cells infected with FP L1R and FP A27L showed diffuse cytoplasmic fluorescence (Figure 4A, 1a-c, 2a-c), although the specific staining with FP L1R was only slightly greater than the negative control, in all of the cell lines. Conversely, there was specific, greater, granular perinuclear and cytoplasmic localisation in the cells infected with FP A33R and FP B5R (Figure 4A, 3a-c, 4a-c), which was particularly evident in the MRC-5 cells infected with FP A33R . FPwt-infected cells were always negative (Figure 4A, 5a-c). Immunofluorescence performed at 6 h p.i. gave similar results (data not shown). Membrane immunofluorescence was present only after infection with the FP A33R recombinant in MRC-5 cells (Figure 4B, 1b vs. 1a). Polyclonal and monoclonal antibodies were used at different dilutions for the different recombinants (Table 1). Heterologous protein localisation by immunofluorescence. (A) Intracellular immunofluorescence was detected in all of the cell lines, with differences between the proteins ascribed to MV or EV particles. In cells infected with FP L1R or FP A27L the cytoplasmic immunofluorescence was diffuse (panels 1a-c, 2a-c), and in FP L1R -infected cells, the difference with the negative control was very low. Conversely, specific, granular perinuclear localisation was shown by the cells infected with FP A33R or FP B5R (panels 3a-c, 4a-c), which was particularly evident in MRC-5 cells infected with FP A33R . FPwt-infected cells were negative (panels 5a-c). (B) MRC-5 cells showed membrane immunofluorescence only after infection with the FP A33R recombinant (panel 1b vs. 1a). To determine whether the FP recombinant virions produced by the CEFs were carrying the structural products of the four transgenes on their surface, the 4FPmix, containing a mixture of all of the FP recombinants, was incubated with VV IHD-J hyperimmune serum. No reduction in plaque numbers was detected, as compared to samples where pre-immune serum was incubated with the IHD-J virus. High neutralising activity was seen in samples where IHD-J was pre-incubated with IHD-J hyperimmune serum (Figure 5). Virus neutralisation assay. A mixture of all of the four FP recombinants (4FPmix) was incubated with IHD-J hyperimmune serum to determine whether the proteins expressed by the recombinants were localised on the surface of the new viral progeny. High neutralising activity was detected only in the samples where IHD-J was pre-incubated with IHD-J-hyperimmune mouse serum. Development of alternative replication-deficient vaccine candidates against smallpox and other zoonotic OPXV infections is still needed as a defence against new poxvirus outbreaks as well as to reduce the adverse reactions of traditional vaccines and the limited immune responses in VV-experienced individuals. Along with discontinuation of the smallpox vaccination campaign and the decline in herd immunity in most countries, an increase in MPXV infections has been described [40, 41], which has mostly occurred in children, young adults, and immune-compromised patients . MPXV is widely distributed in a variety of African rodents, and particularly in squirrels, which might be the reservoir , and it has the potential to be used as a bio-weapon [41, 44, 45]. Outbreaks of human MPXV infections were also reported in the Unites States in 2003, with 69 people infected following the importation of MPXV-infected rodents from West Africa. Also, in the Republic of Congo in 1996-1997, there were 92 cases and 3 deaths , which might have been related to the overall vanishing immunity against poxviruses throughout the world community. The available smallpox vaccines based on VV show relatively high rates of adverse side effects, and new strategies should therefore be devised to improve the safety of traditional smallpox vaccines. Replication-deficient vaccines should reduce the risks for animal handlers that arise from accidental exposure to cowpoxvirus and other OPXV, limit the OPXV-infection of domestic animals, and should be useful for protective immunization in the event of intentional or accidental release of variola virus. In the present study, we have described the characterisation of four new FP recombinants, FP L1R , FP A27L , FP A33R and FP B5R , that express the VV L1R, A27L, A33R and B5R genes. We demonstrated that: (i) all of these recombinants can express the proteins correctly, although at different levels in different cell lines, as revealed by RT-PCR and Western blotting; (ii) MV and EV proteins show different subcellular localisations; (iii) recombinant FP virions (4FPmix) are resistant to neutralisation by VV-specific serum; and (iv) the four FP recombinants express functional foreign proteins that are immunoprecipitated by hyperimmune serum from IHD-J-immunised mice. Using Western blotting, heterologous VV-specific proteins were detected in cells infected by the four recombinants. Their expression in human and non-human primate cells was often higher than in CEFs, where the virus replicates. This can be ascribed to the cytocidal effect of the FP recombinants in avian cells, although it is not clear why this occurs only for the expression of specific genes. In particular, the higher transgene expression by FP B5R in human MRC-5 cells confirms the results already shown by RT-PCR. IP/WB was used to overcome the difficulty of revealing cell-expressed antigens by conventional Western blotting, especially when using mouse or human hyperimmune sera. This assay, which better avoids nonspecific binding to nitrocellulose and makes the native proteins detectable, showed that these proteins can be recognised by VV-specific hyperimmune mouse serum. By immunofluorescence, the heterologous proteins were mainly localised at the cytoplasmic level for all of the recombinants, and also at the membrane surface when MRC-5 cells were infected with FP A33R . Although no specific differences were observed among the cells lines, the expression of the proteins belonging to MV particles was always lower than the expression of the proteins belonging to EV particles. In particular, the intracellular expression of A33 and B5 was granular, perinuclear and cytoplasmic, which confirms previously reported data, and demonstrates their high expression in the juxtanuclear area and Golgi region . Membrane fluorescence was only detectable after infection with FP A33R . This also confirms previous data showing the spontaneous translocation of the A33 protein to the plasma membrane, which, using a FP B5R recombinant, was only observed in very low amounts by immunoelectron microscopy, but not by immunfluorescence . The very low fluorescence detected after FP L1R infection can either be ascribed to limited protein expression, which was not confirmed by the Western blotting, or to the low avidity of the antibody. This is also confirmed by other studies, where low expression was overcome by the use of the phorbol ester 12-O-tetradecanoylphorbol-13-acetate (TPA) . The absence of neutralising activity of IHD-J-specific hyperimmune mice sera against the virus particles released by CEFs infected with the four FP recombinants suggests that the L1, A27, A33 and B5 gene products may not be inserted into the envelope of the new viral progeny. This enhances the importance of these FP recombinants for their use in individuals who have already been vaccinated against smallpox, where these can be administered as a recall. As human peripheral blood monocytic cells and macrophages are permissive for penetration of the recombinants and expression of foreign proteins , antigen cross-presentation should occur, which should result in complete humoral and cellular immune responses. To avoid lytic infection, ulceration and scab formation after dermal scarification with VV for smallpox prophylaxis, FP recombinants represent alternative safer immunogens. This arises from their natural host-range restricted replication to avian species , their correct transgene expression in mammalian cells, and their ability to elicit a complete immune response in vaccinated hosts . Although these L1R, A27L, A33R and B5R VV-derived genes have already been successfully expressed using recombinant DNA [22, 48], the use of avipox recombinants expressing these genes might provide better control against zoonotic OPXV infections, will offer advances in the fight against the threat of bioterrorism, and can also be used in VV-experienced individuals. Sole Maria Pacchioni, Massimiliano Bissa contributed equally to this work. The following reagents were obtained through the NIH Biodefense and Emerging Infections Research Resources Repository, NIAID, NIH: the monoclonal anti-VV (WR) L1 protein, residues 1 to 185 (similar to VMC-2; produced in vitro), NR-417; the polyclonal anti-VV (WR) L1 protein (antiserum, rabbit), NR-631; the monoclonal anti-VV (WR) A27 protein, residues 1 to 110 (similar to VMC-38; produced in vitro), NR-567; the polyclonal anti-VV (WR) A27 protein (antiserum, rabbit), NR-627; the monoclonal anti-VV (WR) A33 protein, residues 58 to 185, NR-565; the polyclonal anti-VV (WR) A33 protein, NR-628; the monoclonal anti-VV (WR) B5 protein, residues 20 to 275 (ectodomain; similar to VMC-20; produced in vitro), NR-551; and the polyclonal anti-VV (WR) B5 protein (antiserum, rabbit), NR-629. We also thank Dr. Christopher Berrie for editorial assistance with the manuscript. SP performed the production and purification of the FP recombinants, the Western blotting, and the IP/WB. MB performed the production and purification of the FP recombinants, and the immunofluorescence assays. CZ performed the molecular cloning, prepared the primary cell cultures, prepared the Figures, and analysed the data and the study results. CDGM conceptualised and supervised the whole study. EI performed the RT-PCR and animal immunisations. AR designed the study, performed the neutralisation assays, assisted in the animal immunisations, analysed the data, interpreted the study results, and prepared the manuscript. All of the authors have read and approved the present version of the manuscript.